The DNA of the French New Wave flows strongly through Gabe Klinger's debut feature, Porto. Like a lovechild of Jean-Luc Godard and Jacques Demy, Porto is a rough-hewn tale of a one night stand whose repercussions reverberate throughout the couple's life. Shot on a mixture of 35mm, 16mm, and 8mm film, it often feels like something out of another time; a forgotten New Wave romance featuring the indelible imagery of Demy, the wistfulness of Truffaut, and the tragic fatalism of Godard. Yet despite its obvious visual inspirations (and a cameo by the cafe from Godard's Band of Outsiders), Porto never feels like a self-conscious or ironic throwback. Its fractured style and beautifully grainy cinematography feel like a natural extension of its narrative. It unfolds like flashes of memory, out of chronological order, creating an almost Rashomon-like portrait of an affair from each participant's perspective. Jake (Anton Yelchin) and Mati (Lucie Lucas) are two expatriates living in Portugal, who meet at an archeological dig site and embark on a whirlwind romance. Jake is estranged from his family, Mati is embroiled in an affair with one of her professors. Yet they find solace in each other's arms for one night of passion. When they awake, however, the world (and their brief relationship) looks quite different. But as they go their separate ways, the things said and the feelings that erupt that night continue to haunt them. Unable to shake it, they return to the scene of their one night stand, older but not necessarily wiser. Klinger's shifting perspectives search for truth in memory, a place where feelings often cloud reality and things said in the throes of passion become lies upon reflection. Porto delicately sifts through the fog of time and raging hormones to find the essence of their relationship. There is no truth here, only feelings, and Klinger expertly leads us through their cloudy memories into a haunted world of lost dreams and shattered second chances. It's an enchanting and often painful exploration of attraction and love, and what happens when those two things diverge through flawed and imperfect people. Porto is a film of moments, fragments of time lost in the perceptions of the mind. Jake sees their love quite differently than Mati, but their time together affects them both in profound but radically diffrent ways. Perhaps its greatest tragedy, however, is the loss of Anton Yelchin, who passed away before the film was released. As his final performance, it stands as an incredible monument to his talent. It's the finest work of his young career, and a stark reminder of the staggering loss his death represents. It's a haunted, weary performance, that goes from the wide-eyed optimism of the first pangs of young love, to the devastating agony of its loss. He and Lucas have tremendous chemistry, providing the film with its aching, yearning soul. It all makes for an astonishing debut for Klinger, who directs with an assuredness of style and character that are hallmarks of a consummate filmmaker. He creates a world of textures and feelings rooted in New Wave aesthetics that linger like wisps of smoke slowly fading into the night air. Memory cannot always be trusted, but recollections of emotions can be far stronger. In Porto, when memory begins to fade, feelings are all that is left. It's an elegy not just for Yelchin, but for the idea of what could have been, lost forever in second-guessing and false remembrances. This is unmistakably the debut of a major new filmmaking voice. 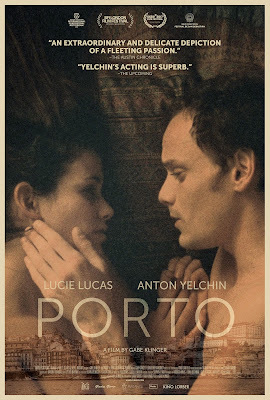 PORTO | Directed by Gabe Klinger | Stars Lucie Lucas, Anton Yelchin | Not Rated | Opens Friday, Nov. 17, in NYC. Nov. 24 in LA.